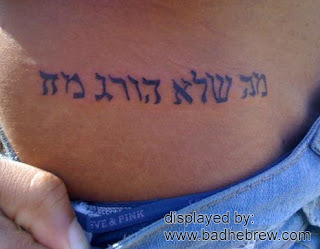 Today we have a video, and not just any old video; a happy ending - the removal of a bad Hebrew tattoo! It's not all that clear, but the tattoo was supposed to say "Beauty" in Hebrew. As often happens, it ended up backwards. Luckily, the girl decided to permanently remove this ink. Looks painful, that. As you can see, it is an elaborate body tattoo, in it's center some large Hebrew lettering that gloriously spells out... Moa. What's a Moa? Your guess is as good as mine.